Rain gave me this super fantastic toy bear - it knits. Well, it pretends to knit. You wind it up and its elbows move up and down, and its head bobs slowly. Actually, the head kind of slumps on the way down, which gives it a hilarious drunken quality. I love it and have been known to wind it up repeatedly and watch it, cackling all the while. It's the little things. 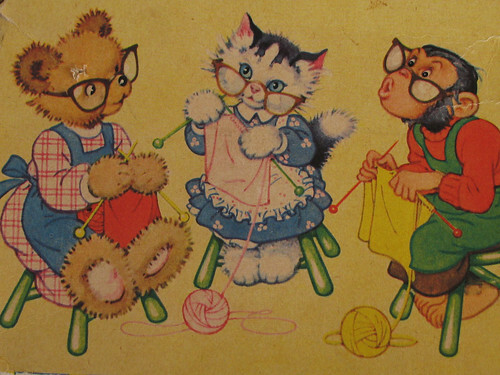 Here's another photo, and one of the box it came in (featuring an illustration of a cat, monkey, and bear wearing cat's-eye glasses and knitting). Rain writes about TV on her blog and on sfist, she introduced me to Lost and Arrested Development so she knows of what she speaks. Speaking of AD - don't forget to check out the 4-episode block on Friday at 8-10pm - they're the last episodes of the series and I assure you I will be laughing through tears. 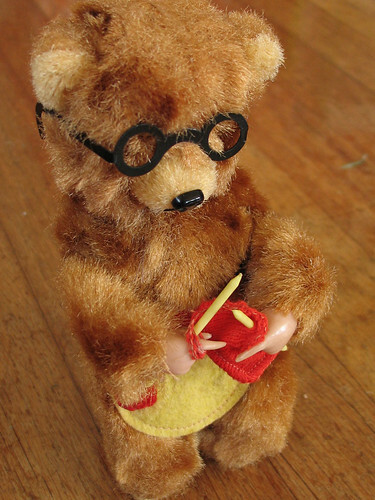 Anyway, back to the knitting bear. Such odd little pointy fingers, yes? I took a very close-up photo of the bear using the supermacro setting on my (newish) camera. I love old toys, and I think their real beauty is in the details. I'm so glad you love the drunken-knitting bear. The photos are awesome! where does a gal get one of those? where? that is really cute, jess. and the photo you took is also beautiful. I am addicted to lost!! 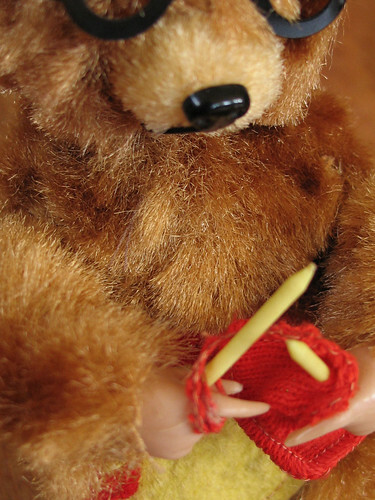 This knitting bear is too much cute! Things this cute should be saved for extreme situations, like crying children or car accidents.